I helped unload the container today and picked up my new 2013 Koncepts. All the way back to Sandy Point there was a 20-25 knots WSW wind. As soon as I unloaded and started to rig up the wind died out! That Murphy fella has a lot to answer for! Looks like there could be a nice breeze tommorrow. Fingers crossed! Funny to see you also discovered bricks are the best rigging help EVER. Are they rigged on SDM or RDM mast? 5m on RDM, 5.8m on SDM, just because they were the cams that came in it. Couldn't be bothered hunting around for other cams. Yeah, I know I'm slack. Just impatient I guess. I can rig sails perfectly well without bricks, I just don't seem to be able to take photos of the sails without them. I know it's yet another serious character flaw, but be assured I am not really working on it! Looks like they need another 4 inches of downhaul. Dani, the 4.2, 4.6 and 5.0 come standard with RDM cams, 5.8 and above with SDM cams. The cams are interchangable so you can run any size with either. Generally we would advise RDM on the 3 smaller sizes with 5.8 being fine on either. 6.2 and 6.6 rig on a 430 and you may see some subtle performance gains on an SDM, that said I ran my 6.6 on an RDM all last season and felt it was quite satisfactory. All the larger sizes we would definitely advise an SDM but it is physically possible to use an RDM. 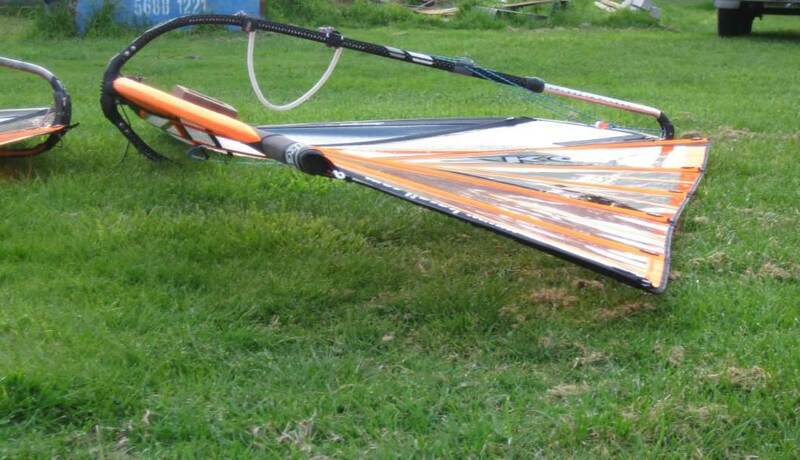 I like the idea of being able to run with a quiver of RDM masts to 430 which I can also use in my Wave sails and then having the larger masts, 460 and above SDM for the best performance in the bigger Race gear. looks like they are evolving nicely. 1.) Do they (well the 5.0 anyway) work on any other brand masts? Severne? /Pryde? I note the specs are the same as 2012. Any other changes apart from the clear X-ply in the luff pocket? Yoyo, Sail design is optimised for a Mast curve of 13.5% + or- a bit . Every one of our masts are measured and they have all been in the 13's. Koncepts due to relatively low luff curve as far as race sails go have been less mast sensitive than most however to answer the last question at the same time the luff round has increased for 2013 (more noticably on the small speed specialised sizes) so they are going to be a bit fussier re mast curve. So yes they will work on other brand masts with compatible curves probably in the range of 12.5 to 14 and a bit. The closer you get to 13.5 the better. 2013-- outline the same as 2012 when we did the big changes but luff curves altered and seam shaping revised, more shape in the lower and the negative shaping in the top revised to tune twist. Aim was more profile down low in the speed sizes to provide drive when deep downwind. Also to help them work better on RDM,s as they tended to rig flatter at boom height on skinny's. We all love running RDMs on the speed course, more confidence that they will survive the big off's at 40+ knots!!!! Not sure the boom lengths are 100% the same , need to check as from memory we increased the stepped clew a little bit, but I might be dreaming. And of course there are new sizes allowing a better choice for varying rider weights. A few guy's used their 4.0's last year, would need to be a cyclone for my f..t a..se to need one!!! The 4.0m is certainly not twitchy. The boom is only a couple of cm shorter than the older 4.4m's and this was deliberate. It can be set will plenty of depth and trimmed flatter with out haul. We found it works better on stiffer masts and was actually designed with bottom cut 370 RDM masts in mind as there are so few 340's around. There were some changes in 2012. The 2011 was RDM only with standard SDM cams. 2012 uses RDM cams although I think I have a SDM cam in the top. 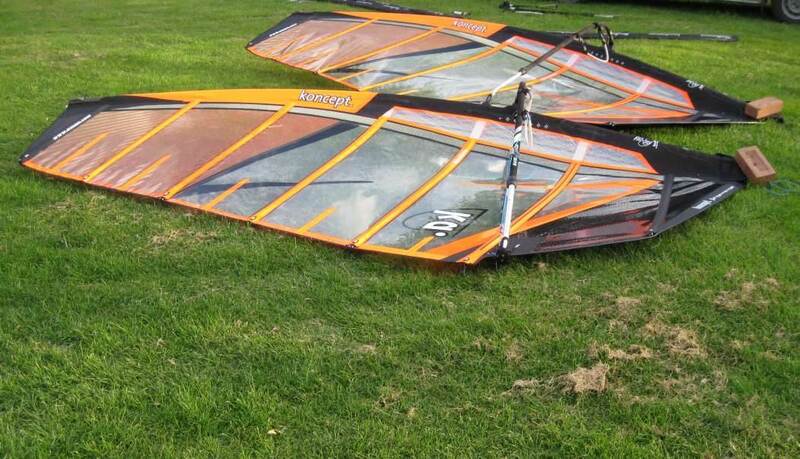 In Sandy Point speed conditions the 4.0m is usable for us 73-75Kg guys from about 35+ knots up on small speed boards. Looks like you got that extra down haul just right! Nynaa, nynaa. I got to sail my 6.6m yesterday! It was REALLY sweet on the RDM. I think you wil like it a LOT! 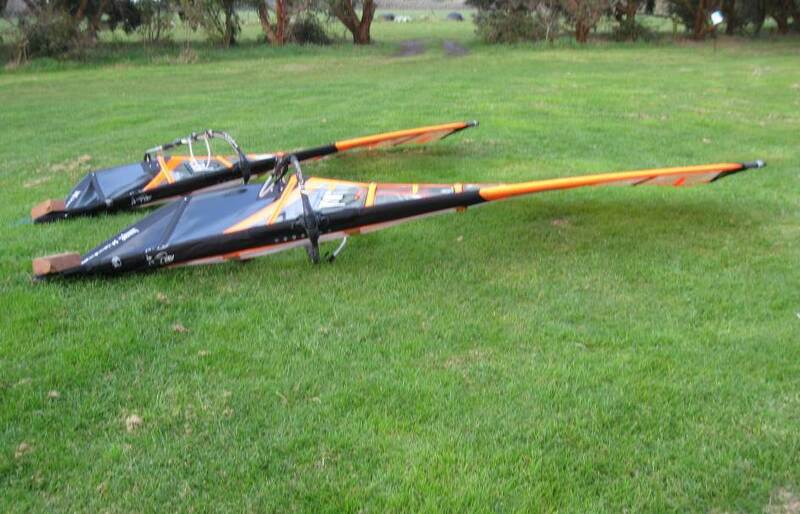 Not an extra 4 inches of downhaul / Sulo Bin Prop / leeward side view very nice. geez Ado, ever heard of a mower mate!!!! A they all rigged to the specs specified on the sail? LOL! Only two weeks growth! 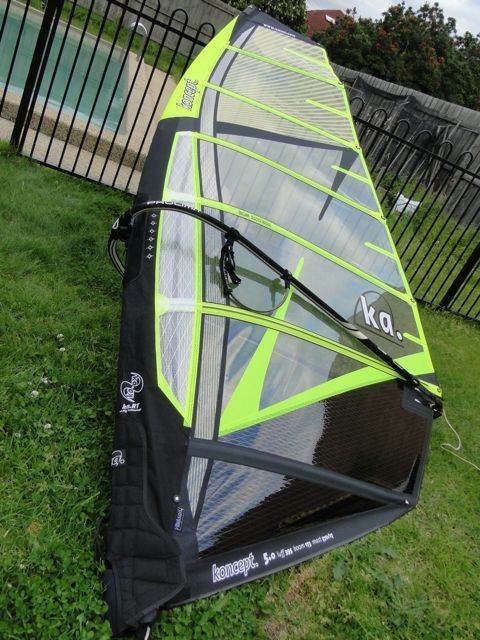 Becuase i know with my 2012 races from 5.5-7.1 rigged on KA SDM masts, i gave the 6.3 an extra 1cm and the 5.5 and 7.1 i gave an extra 2cm to what was printed on the sail for the luff length. Yer agree on going with feel and look but was just wondering if you and the guys that put pics up of their sails went with what was printed on the sails for recommended settings or if you used different settings and if so what they were? Also rigged a 2013 7.1 Race on a KA SDM. Again luff was spot on but I was nearly block to block. I think when it stretches in a bit I will be 1 hole longer which sounds like where you are with your 2012 Races. Start with the printed spec and then tune.NB you will get some small variation depending on your mast and on your extension. I was using a KA RDM, KA boom and Chinook extension. I've got a 6.2 and 5.4 koncept coming for this year, but will be running them on SDM masts, may try the 5.4 on a RDM at some stage, as I have a 400 mast that has a mast curve of 13.5 %. I'm keeping the 7.1 race for the lighter days. Seriously 1" would have that leech getting pretty loose and flatten out the lower section below the boom defeating the purpose of such a sail. Sure it will work like that if it's cranking and your running tight back and forth and don't want to change down. Loose leeches and numbers on a sail are a guide when rigging and change over the sails life, more so in its first several uses. One of the biggest inputs into how a rig performs and feels is how well the user is able to tune the sail to what feels and performs right for the them and the conditions. Such skill is acquired over time and learnt by playing around with settings and learning from others with similar kit. The Koncept leech looks very suttle sitting still, but actively works under load without flapping back and forth erratically, it should look stable and under control twisting off when required. 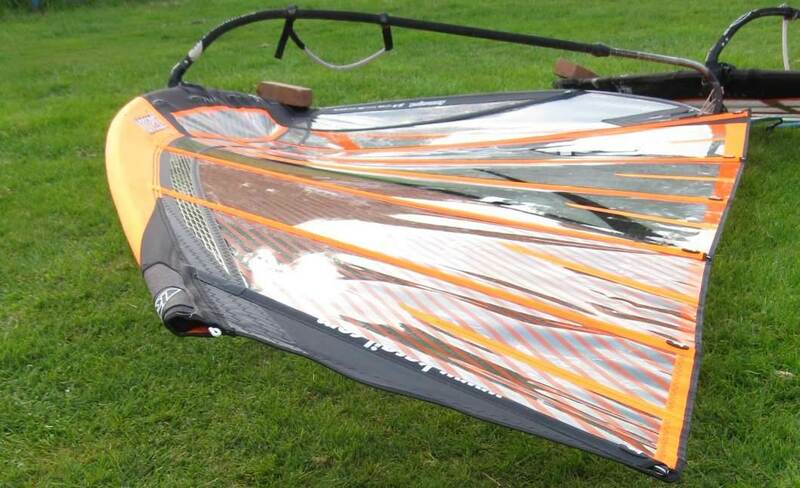 Sure you can over downhaul it to look like other sails but remember not all sails are designed or perform same. Why cant you guys take some advise, I am not criticising KA only the way it was rigged. Kato and Adrian can rig the sail right, maybe Daffy can look at that. I am not talking about floppy leeches Spotty I am talking about the profile below the boom including the loose luff pocket below the boom. When your mast is under load it bends side ways and will tighten the leech, I didnt think I had to tell you guys that, you dont sail on the grass do you. Hey, but its your regatta. Happy sailing. Yeah some good points there Rick. 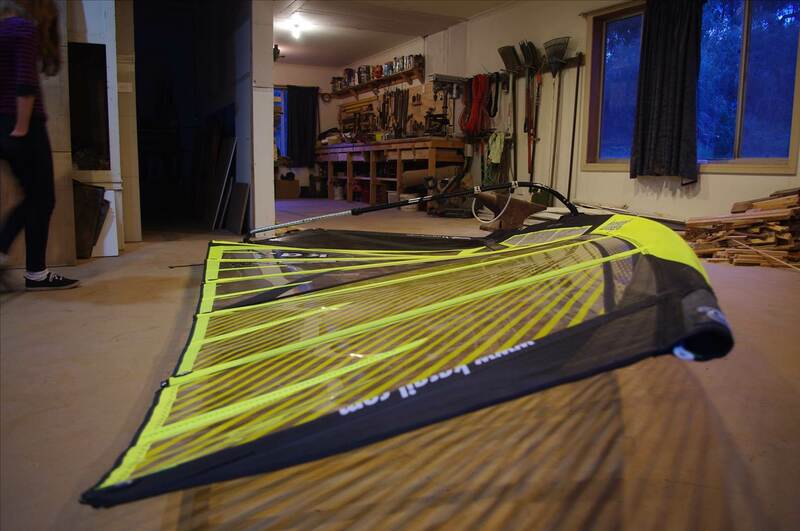 Andrew's Koncept luff does look loose on the windward side. My understanding is that if it were really tight and because of the Koncept's deep draft, it would impede smooth rotation of cams but more importantly, affect how deep the draft can be down low because the luff is in too much tension. Look at my photos of the leeward side which is really smooth. That's what's critical. 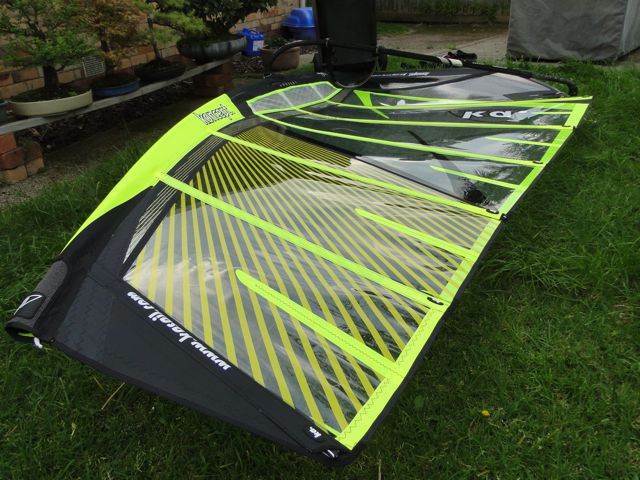 A tight luff may work on a slalom or race sail, such as a Pryde RS or Severne Code Red, but these sails are not designed for pure speedsailing, especially in the smaller sizes and that's why they end up being so flat and why you need to use larger sizes to speedsail effectively. We're just playing a different hand with the Koncept to achieve the same end. As speedsailors we're more interested in efficiency and power when sailing broad than sail area and masses of twist. We want all of the sail working when going broad, not just the bottom 2/3. Why cant you guys take some advise, I am not criticism KA only the way it was rigged. Kato and Adrian can rig the sail right, maybe Daffy can look at that. I am not talking about floppy leeches Spotty I am talking about the profile below the boom including the loose luff pocket below the boom. When your mast is under load it bends side ways and will tighten the leech, I didn't think I had to tell you guys that, you don't sail on the grass do you. Hey, but its your regatta. Happy sailing. Always open to good, reasoned suggestions Rick. I rigged those sails how I will probably use them for speed, very broad off the wind. I have found through experience that, unless I am really overpowered (in which case I usually switch down a size), deeper below the boom is faster. The 5m is was rigged on an RDM mast and I might look at a couple of cam spacers to pull the luff a but tighter, but I would not do that unless I felt the shape of the sail would benefit from it. I don't find any other reason to deal with a very minor cosmetic matter like a few small wrinkles on the windward side of the luff where they have zero negative affect on performance. If setting the sail that way gives me a faster speed on the strip, that's how I will set it. I still have a bit of experimentation to do when I get these sails on the water, so I will try your suggestion and report on what I find. 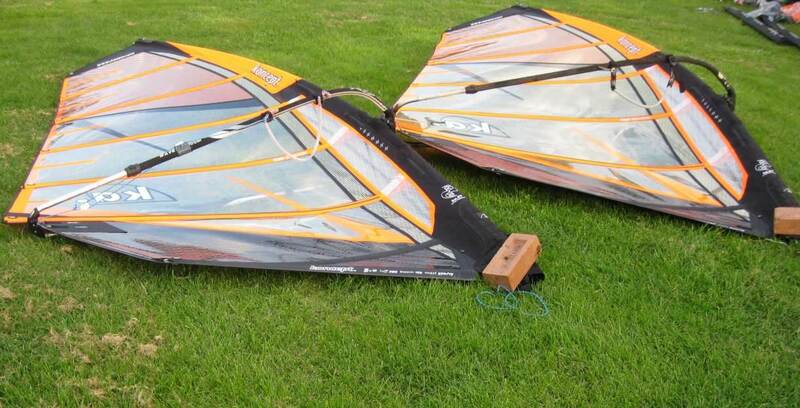 These smaller speed sizes are really optimised for true deep downwind speed sailing. They are really full and powerful in the lower section of the sail . Some of the guy,s sail them with a bit less downhaul than you would a race sail for slalom racing. 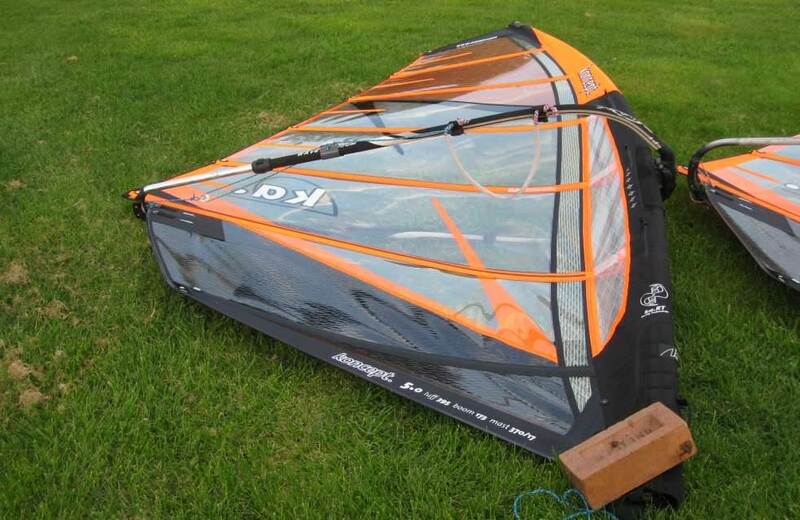 They also sail a bit smaller so are trying to get maximum drive and efficiency from a smaller sail. 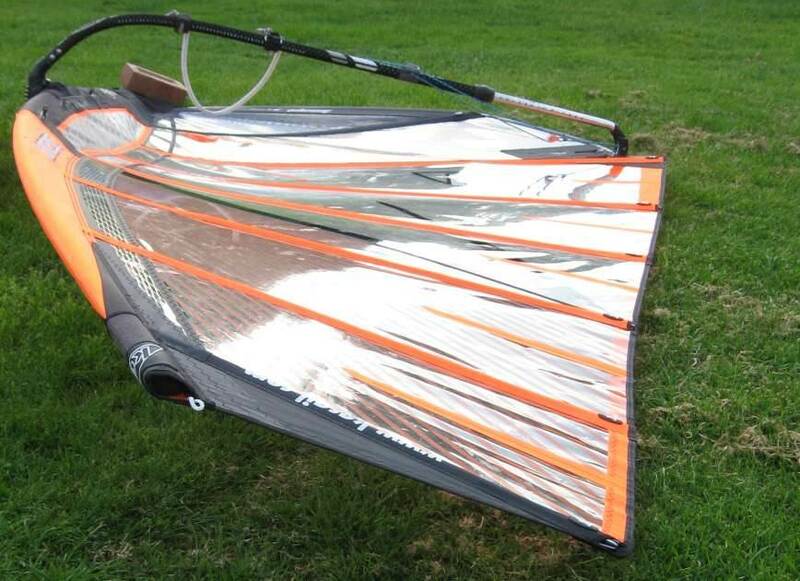 The lighter PiT Crew guy's like Andrew have found they are quicker on a smaller sails rigged very fat like this. For 2013 they have more shape and luff curve so I think the guy's will find they are running higher downhaul tensions than in previous years. 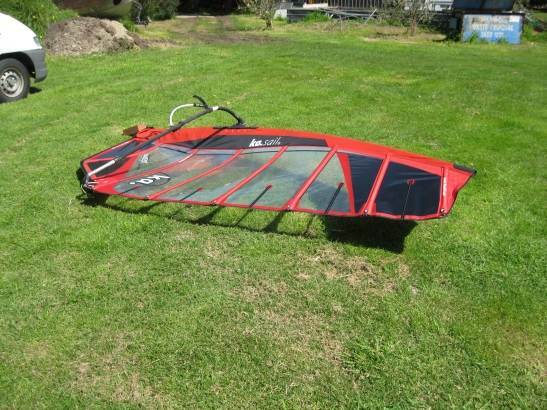 Unfortunately we just didn't get enough really good days at Sandy Point this Winter to figure out the optimum trim on the prototype sails for true downwind 'World record" type speed sailing, but all the indicators are that the sails are going to be really fast. Spotti did a 48peak on a day when most people didn't bother rigging due to the crap conditions!!!! We can't wait for a good day!!! Bring it on. I was looking at the ka website and couldn't find an 8.5m for 2013, they are being made this year aren't they? I can feel an early xmas present coming on. 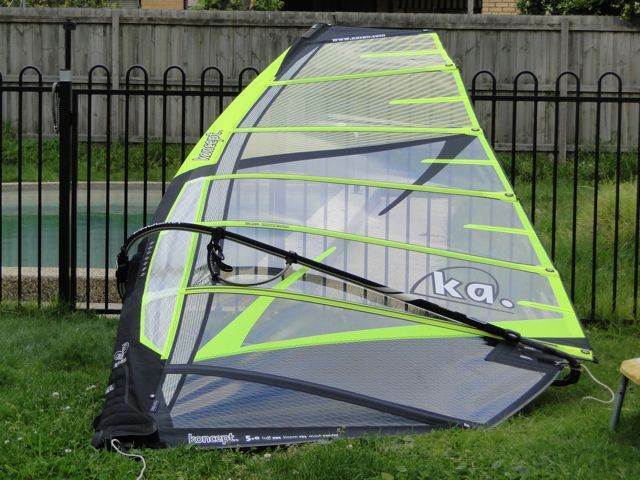 There is supposed to be an 8.5m and a 9.5m Koncept. They are in the order worksheet we received a while back. 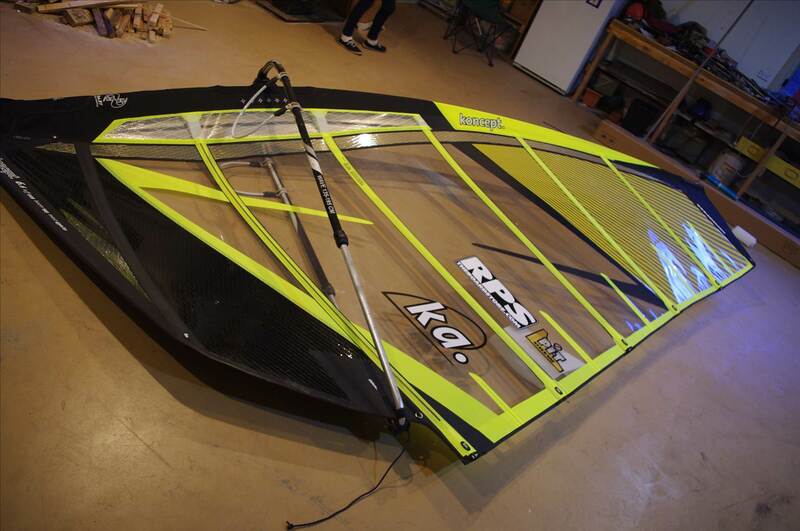 2013 8.5m specs = Luff 501, Boom 228, correct Mast 490/29. It may be that they just don't have stock of that particular size yet.